It’s important to go into this saying that there’s no 100% proof that this is real, but it’s being reported as real, so we wanted to bring it to you. 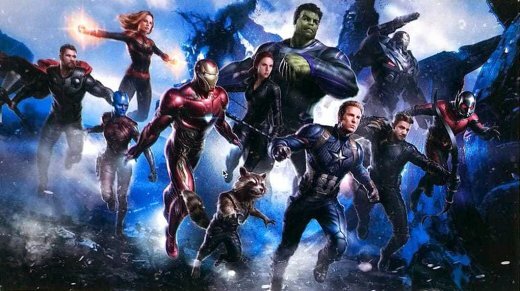 Two promo images have leaked from Avengers 4 and they give fans in search of new info on the upcoming Infinity War sequel some interesting bits of info to chew on. First up, we’ve got the new Avengers: Captain America, Iron Man, Thor, Black Widow, Rocket, Gamora, Captain Marvel, Hawkeye/ Ronin, Ant-Man and War Machine. Check out how beefed-up War Machine is in the pic and how they’ve incorporated aspects of Hawkeye’s Ronin costume from the comics into his uniform. Speaking of uniforms… why the hell is hulk wearing one? I guess it does solve the problem of him losing his pants whenever he gets angry. Just as interesting as the people in the picture are the ones who aren’t. There’s no Wasp, no Shuri (if she survived the dusting, it was expected that she’d take over as Black Panther), and there’s no Wong. We know that Dr. Strange’s cape was injured in the battle on Titan, but there has been some speculation that Wong would wield it until they found a way to bring back the heroes. There is, however, always a small chance that the cape we see on Thor could be Strange’s. 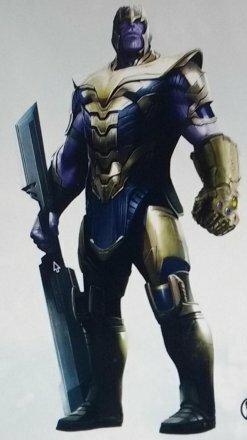 The other image that was leaked is Thanos. He’s got a fully functional Infinity Gauntlet, as well as double-bladed staff that you’d have to imagine, will be the end of at least one of our heroes. In the end, this might not even be real, but it’s fun to imagine that it could be. We’ll know for sure when Avengers 4 hits theaters in May of 2019.